Hey, everyone! Sunny here in her first ever published article! -jumps up and down- In this article I will talk about Petpet Cannonball, hopefully to help you better understand the game, and also to give you some pointers! Petpet Cannonball is a one-player game, designed for you to shoot helpless little petpets through a bottomless bucket, down the tarp to safety! What you don't want to do is make the petpet crash into the barrels or the wooden poles. That wouldn't be very nice now, would it? This game revolves around the fact that, one day, a group of pirates, pretty wussy ones, I might add, decided to have target practice. They grabbed their petpets, cried "Aye, mateys! ", and loaded them into the death machines. Use the Up & Down arrow keys to adjust the angle of your cannon, raising it higher or lower. The spacebar is used to launch the petpet. The longer you hold down the spacebar, the farther the petpet will be shot. As you hold the spacebar, the little bar below the cannon will be filled. The more the bar is filled, the more power the petpet is launched with, and the farther the petpet will fly. The angle of the cannon will affect how much power you need. For example, let's say your cannon is at a 45 degree angle, and another cannon is at a 55 degree angle. The 45 degree angle cannon will not need to use as much power because the petpet will not need to travel as long as if it was launched in the 55 degree angle cannon. The larger angle cannon will need the extra power to make the distance into the bucket. You receive points as each petpet makes it through the bucket. How many tries it takes you to get a petpet through the bucket also makes a difference. You get ten tries to start with and you gain one try with each success, but never exceeding ten. But be careful; with each failure, you lose one try. Zero tries left and the game is over! There are seven petpets total, each weighing different. The weight of the petpet currently loaded in the cannon is located under the power bar. The more a petpet weighs, the more power is required to successfully get it into the bucket, and the more the power bar will need to be filled. Remember what I said earlier about the angle of the cannon also; the higher the degree of the angle of the cannon, the more power you will need. It will take lots of guessing to determine which angle you need to use, and how much power for each petpet. Some methods that people have developed to find the correct power for each petpet include aligning the power bar so that it reaches to certain characters (i.e :, k, .) and counting out to a certain number and releasing the bar then. Eventually, you will develop your own logic for successfully shooting. Even though the heavier petpets seem harder to correctly shoot, you get more points as the weight increases. The Buzzer is worth the least amount of points for a success, while the Snowbunny is worth the most. After every three successful shots, you gain a level. As the level increases, so does the difficulty, resulting in the cannon receding and the power bar filling faster when the spacebar is pressed. In the last levels sometimes only a mere tap is required to fill up the bar enough. Fortunately, during the first shot of every level, you are able to use a "dotted line" that lines up your shot. If you align the dotted line so that it travels through the bucket, you are pretty much guaranteed a success. Also, don't be alarmed if your power bar fills up too much. Keep holding on to the spacebar, and when the bar is filled all the way, it will retreat the other way, lowering the power, and when it reaches zero power, the bar will fill again, and etc. etc. Now I know what you are thinking. How would I ever be able to make all those petpets into the bucket with only ten tries? Fear not! The most important tip I can give you is Practice Makes Perfect! After you play enough times, you will almost always be able to accurately guess what angle to align the cannon at, and how much power to use. I know that grand masters, and sometimes I, can even shoot petpets successfully without even looking at the bar! You will not be able to beat the game your first try, or at least get a lot of points, but don't get discouraged! We all started out the same way, and believe me; we had the same difficulties you had. Also remember to take your time before you shoot a petpet. The game is not timed, so take advantage of it! Set your cannon and your power bar to exactly as you want it so that you can succeed. Don't just shoot off randomly as fast as you can; the petpets will thank you. Another major thing to remember is the one exception to the -more weight results in more points- rule. Commonly referred to as the "bonus pet", it is also known as the TENNA. Now, you may think that the Tenna will result in fewer points, since clearly the Angelpuss and Snowbunny weigh more. Well, think again! When successfully shot, the Tenna gives you a ton more points than a Snowbunny or Angelpuss ever could. It is very important if you want more than 800 points (almost always required for a trophy), and the fact that they are very rare, that you get these in! But please note: If you do get a Tenna and successfully get it into the bucket, you may not always get over 800 points. This sometimes requires one more thing, which is my next and last point. Okay, so you've played the game 500 million trillion jillion times and can play it successfully with your eyes closed, but you can't seem to get more than 760 points! Well, my friends, there is a trick that grand masters use to score over 800 points: Tap the spacebar after your last shot in the last level. While this may seem simple, it certainly is not. Right after your last petpet disappears, and before you see the GAME OVER sign, quickly, and swiftly, tap the space bar. This will give you the extra points for that petpet if you are lucky enough to get another in, and you will probably get enough points to get on the high score table, maybe even a trophy! I myself have not been able to succeed with this, but I know other people have. Keep trying, and someday you might too! Well that, fellow Neopians, is the end of my game guide. 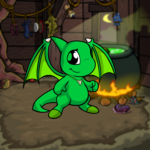 I hope that you have learned a little something about Petpet Cannonball today, and that you too can succeed in this game! Now go and play! Disclaimer: No petpets were harmed in the making and writing of this Game Guide. The Renegade Comic - When Meepits... Dress Up?